Be ready for digital learning today, and tomorrow. Building efficient, impactful, future-ready districts takes planning. 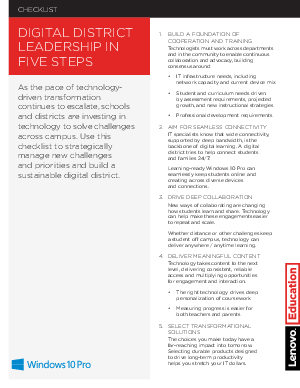 Our checklist, Digital District Leadership in Five Steps, helps you get started by asking the questions needed to identify new learning opportunities supported by technology. How can new content engage students? How robust is your network? Do you have the right technology resources across classrooms? Let’s get started now. Download this checklist.